Hamburg, Germany, 19 February 2018. 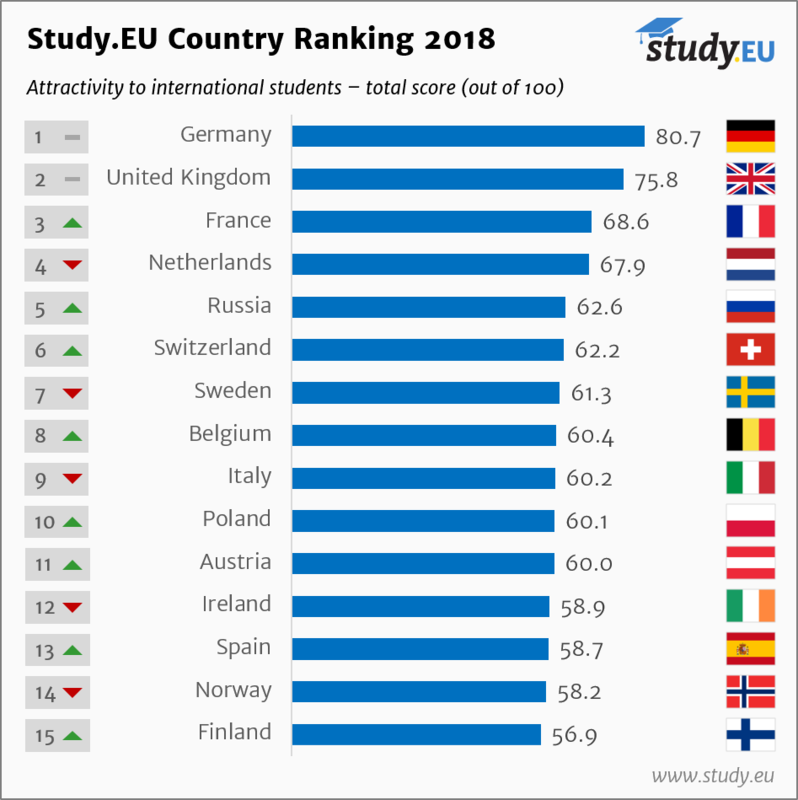 In the 2018 edition of the Study.EU Country Ranking, Germany once more ranks as the most attractive country for international students, followed by the United Kingdom and France. Life & Career (25%) considers a range of factors with regards to the quality of life and career perspectives for international graduates. This year, the country ranking takes into account personal safety as a factor in the Life & Career category. “We have noticed that students are increasingly concerned with the safety in their host countries,” says Study.EU CEO Gerrit Bruno Blöss. The score for personal safety is based on analyses in the Social Progress Index and includes, for instance, homicide rates, rates of other violent crimes and incidents of political terror. “Based on those statistics, most of the countries in our European ranking are safer than, for example, the United States,” Blöss adds. Study.EU is the gateway to universities in Europe. As one of the leading information providers for study choice in Europe, it offers students details about more than 7,500 study programmes. The Hamburg-based company connects students from around the world with European universities, enabling them to pursue the academic path they aspire. Study.EU closely cooperates with institutions of higher education as well as governmental organisations throughout Europe.